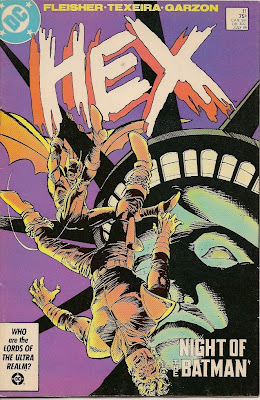 Hex #11 "Night of the Bat"
They went after Jonah Hex. They are using something that can be shout out of the sky. And of course, Jonah does just that, nailing one machine but suddenly another hovercraft comes swinging along and blows the bejesus out of the other thug. It then lands and the guys inside present Jonah with the bloody outfit of Stiletta's. Deep underneath the ruins of the Needle, Reinhold Borsten is clawing his way through the rubble when he hears someone else digging DOWN towards him. It turns out to be Kinglet. Hmm, Kinglet? Kinglet? I THINK he's a doctor or a flunky. I'll check and get back to you later. ANYWAY, Kinglet has found Borsten and he is wearing an airtank and a mask. He tells Borsten that they will have to share the airtank but they can make it back to the surface. 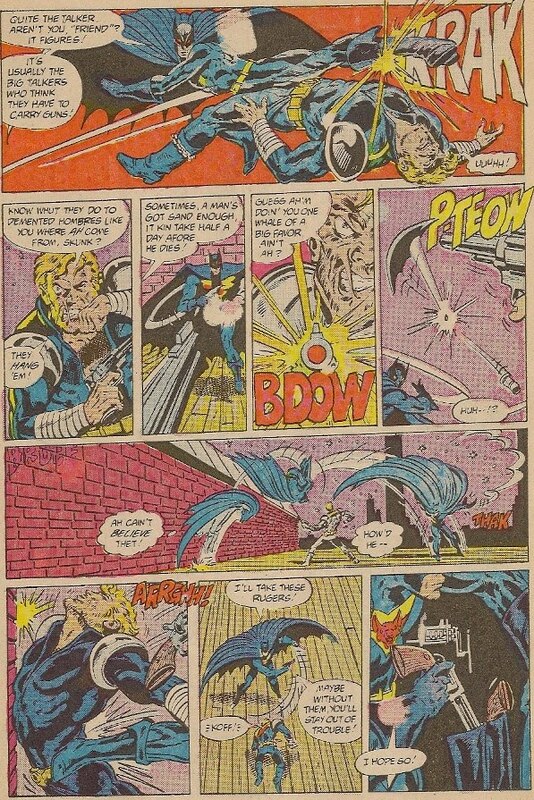 Borsten grabs the air mask, whips out a pistol and kills Kinglet. Borsten then dons the airtank and as he claws his way to the surface he mentally vows that he will make Jonah Hex suffer for having caused Kinglets death. Wow, I thought Quentin Turnbull was one twisted dude. That's right, it is the Batman of 2050 and New York City has a no gun rule that he upholds. Batman beats the living crap out of the smugglers and then blows up all the weaponry that the smugglers were bringing into the city. 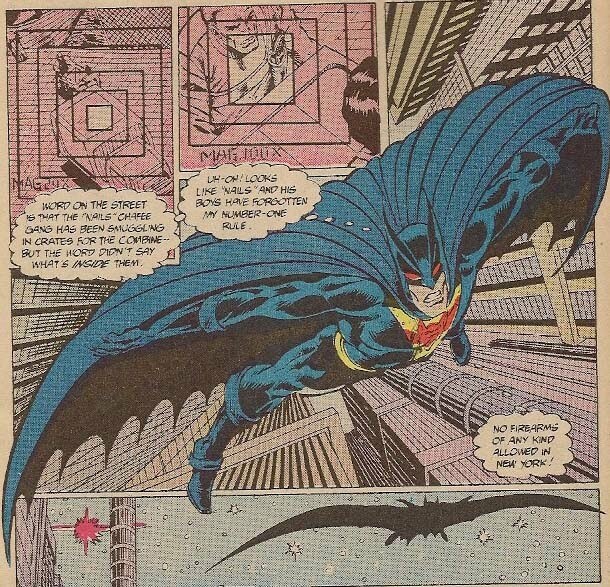 He jumps into his Batplane and returns to his secret lair deep within the Statue of Liberty. It is then that we are treated to a ..
Five short years ago (2045) Batman was a world-class gymnast and a doctoral candidate in Criminology at the John Jay College of Criminal Justice in New York. He idolized Batman and finally figured out that Batman was really Bruce Wayne and had actually discovered the original Batcave. He was in the Batcave when the missiles were launched. He survived the war and missed the madness that ensued. Both of his parents also survived. His mother, Miram Cohen, was a rabbi and was a proponent of gun control. His father, Kenneth Cohen was a top level disarmament negotiator under three administrations. Sadly, they were of two groups that were targeted in the new mob mentality, Jews and Gun control advocates. One evening, they were gunned down and therefore the new Batman was born. The next afternoon, deep in the heart of New York in a fortified headquarters we see some very large robots withstand lasers, huge titanium hammers and other dangers. The owners of the robots are pitching them as new 'enforcers' for NYC. Sadly, all of the firepower that the robots were to have has been destroyed by the Batman. The owners are telling their clients, the Municipal Welfare Council, that the robots will be unable to fulfill the order until the Batman is gone. Who should control crime in this town, a vigilante or the people? That night, Jonah Hex is dropped of in the slums by his new 'friends'. Jonah, not knowing who or what Batman is, and not knowing of the Batman's rule, boldly walks through town with his pistol strapped to his hip. It doesn't take long for Batman to locate Jonah and swoop down, starting a fight. 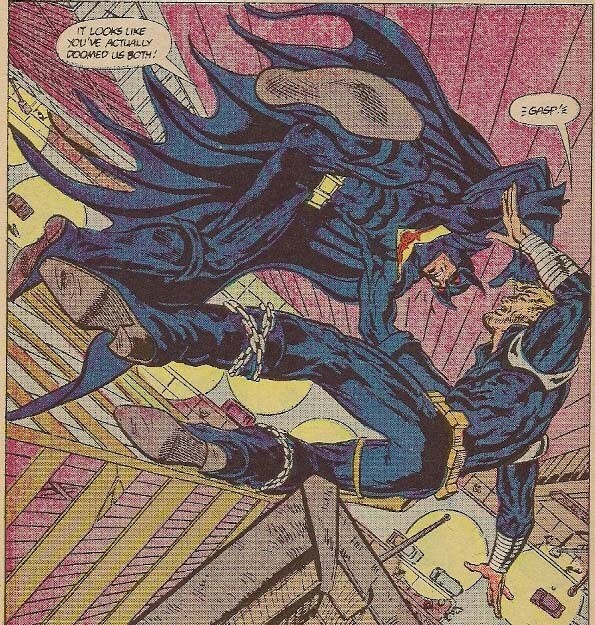 Of course, Jonah recognizes the man who beat Stiletta and is more than happy to take on the caped man. Timeline - This issue starts and the end of the prior issue and then we have one day pass. That would mean that we are now end on day 16 of Jonah in the future. Wow, That's a busy two weeks for anybody! If I have to accept that Jonah Hex is part of the DCU (and I don't want to) this is a fun story. 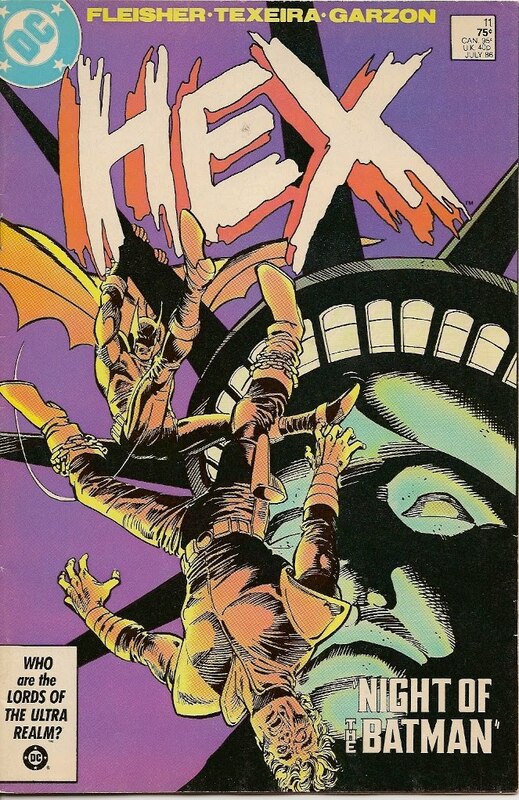 Hex is a pawn and gets suckered into the fight with Batman. 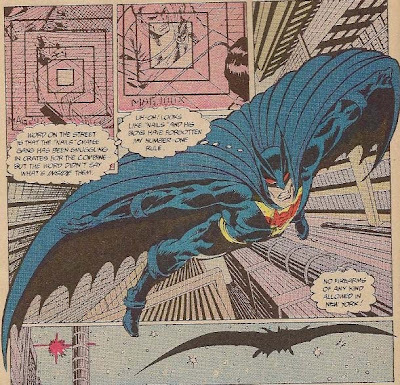 This version of Batman, while understandable in his mission, kinda tosses aside the stuff he should have been learning in college about the Constitution and decides to take everything into his own hands. Granted, the 'law' is now the Conglomerate (aka The Mob), but it appears that he has no forward vision of rebuilding a society that can govern itself. And of course, we get Jonah Hex in New York so what is not to love? This issue gets a thumbs up. Next Issue: Will Jonah get his pistols back? Will he survive that fall from the roof? Find out and watch the fireworks when the giant robots get involved and everything gets blown all to hell. Jugs & Demons, or How to lose readers without even trying. Back in the 90's I was reading comics and I noticed a trend that I didn't like. I referred to it as "Jugs & Demons" because, it seemed, that in order to sell a comic, every publisher thought they had to adorn their books with women burdened with massive chests OR there had to be some sort of demon or demonic activity throughout the book. At best, it became wearying and I started searching for an alternative. That is when I stumbled upon the work of Don Rosa and the wonderful re-presentation of Uncle Scrooge. For the first time in years I was excited, laughing and enjoying comics. Better yet, I was able to share them with my sons. Batman and Robin #13 - What in the ever loving hell is going on in this book? I have a friend who sometimes will just say the most random thing because he has been thinking about the topic for some time, had a whole conversation in his head, and then his mouth splurts out part of that conversation but nobody else has heard what he has been thinking. That, my friends, is Grant Morrison. I have been able to ignore some huge hunks of story that have gotten no explanation whatsoever in this book (thinking I would be able to catch-up as we went along), the level of violence has been very unsettling, and I am to the point where I don't want to invest $3 in something that I am no longer enjoying. I also don't want to invest $30 to find out a year later I've been sold a huge stinking pile of crap because the writer can't pen a story with a beginning, middle, and an end. Batman & Robin? DROPPED! Doom Patrol #12 - I like the Doom Patrol. I liked them in the far past, I enjoyed the relaunch, I even kinda enjoyed the John Byrne stuff. The current series, while having some great ideas and some issues that helped bring the reader up to speed, has just fallen into a huge mess with characters completely unknown to me spouting out stuff I can't understand. I'm assuming that some of the folks that have popped up recently are from the Vertigo books, but without ANY hints as to what/who/why/how they are, why should I give a damn? I know Animal/Vegetable/Mineral Man, but who is the porcelain chick, what is this bug lady, who was the poor dead lady in the yellow jumpsuit, what is that white thing and why, when I start every issue, I feel like I have missed the previous issue and when I look back at the prior issue I realize that I haven't missed an issue, I just haven't been privy to Mt. Giffen's running monologue in his head for the past month. Doom Patrol? DROPPED! Superman/Batman - This book has been on again/off again for some time. The recent Worlds at War storyline was definitely not needed. Worlds at War, a series that I didn't read any of, was, what? 10 years ago? Why now introduce a three issue arc in the middle of a book and throw folks completely off kilter? But then Paul Levitz came on the book and we have some storytelling going on. But I'm still bitter about the WaW and I may drop the book because I'm not getting $3 of fun from it. Superman/Batman? 2 more months! No, 1 more month! Green Lantern/Green Lantern Corps - I never cared for Green Lantern. Never cared for Hal Jordan. Guy Gardner was just a pain in the Justice League. Had no need for the ring-slingers. However, at the behest of Eldest Son, I started picking up the books and I do enjoy the story-telling. I have had to do a lot of catching-up but without the aid of the internet, I can pick up some history of the past and realize what is important and what I should be paying attention to. Now realize, this is without me having to purchase every Blackest Night crossover and without me buying Brightest Day. I can enjoy the books as they are. Taking a character I never read and keeping me coming back each month? That's good work. GL? Keeping! Jonah Hex #57 - Jonah Hex, for me at least, never existed in the DC Universe. For decades he was on his own, floating along in WWT or his own book. But then DC decided they needed to be cute had a Justice League crossover, then another one, then Jonah would pop up randomly whenever they needing something to do with the Old West. Why? Because Jonah Hex was the most famous person in the 1800's and no matter where, no matter when a DC hero was in the 1800's, they ran into Jonah Hex. When the new series started, I was happy but then there was the El Diablo issue. Then another one. And even once again he works with El Diablo. Now we have a Jonah Hex that can routinely walk among the supernatural to the point that film-makers think they have to give him a super-power. We have Jonah Hex picked up in Darkest Night (burf!) and in the most recent issue Jonah Hex goes head to head against Scalphunter (yay Scalphunter! ), Bat Lash (yay Bat Lash), Cinnamon (? Aw crap, she's an adult in the late 1800's! WTF? ), Nighthawk (boo Nighthawk!) and the Trigger Twins (boo TT). Again, Jonah is pushed into a universe where the masks (Nighthawk) and the oddities (Trigger Twins) seem to be normal. Am I gonna drop Jonah Hex? I lived through the Wheelchair Bounty Hunter, I think I can live through this hiccup. However, I think that this trend to roll Jonah into the DCU will be with us for quite some time, much to my chagrin. Jonah Hex? Keeping! Dang! I forgot to title this earlier! Well, only two things in THIS post, at least. 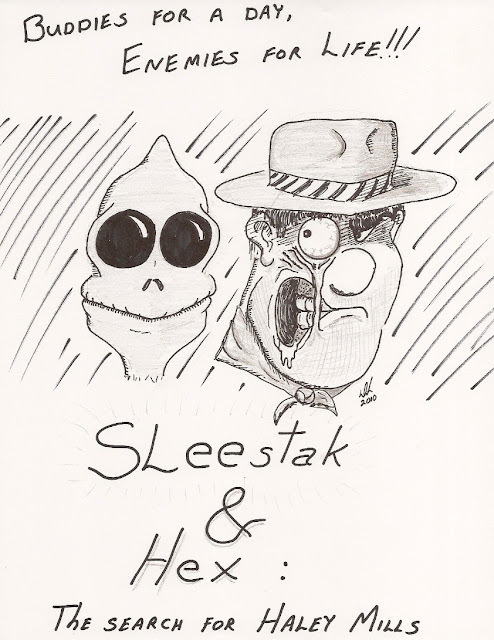 First up, the ever wonderful Sleestak at Lady, That's My Skull has written a new ending to the Jonah Hex film that actually makes use of the super-power that WB just HAD to give Jonah. Read it and weep. Weep because it is so much better than the flop that appeared on the screen and weep because we will never see it filmed. Next, It'sJustSomeRandomGuy has given us a mashup of the two cowboys that battled for the silver screen this summer.